This is of enormous importance and significance to us. The Light which is Jesus Christ is here, in our darkness, burning with an inextinguishable flame and bringing the light of truth, revelation, life and hope into the lives of people who are able to see and receive it. Because He is here with His Light shining two things are happening to the darkness. Firstly the darkness is beginning to pass. Take note of that tiny word ‘is’. It is not ‘might’ or ‘maybe’ but ‘is’. By virtue of the Light that has come amongst us the darkness has begun to give way. And the more brightly the Light is enabled to shine the more the darkness will have to retreat. This is both a physical law and a spiritual one. Secondly, the Light enables us to see the darkness more clearly. We will both perceive that it is darkness and realise the nature of it. Whilst we might fear that the darkness is increasing it may also be true that we are enabled to see and recognise this darkness more clearly – which means that the Light is shining with increasing strength and clarity. What before was hidden is now progressively being revealed in greater detail. God is at work. 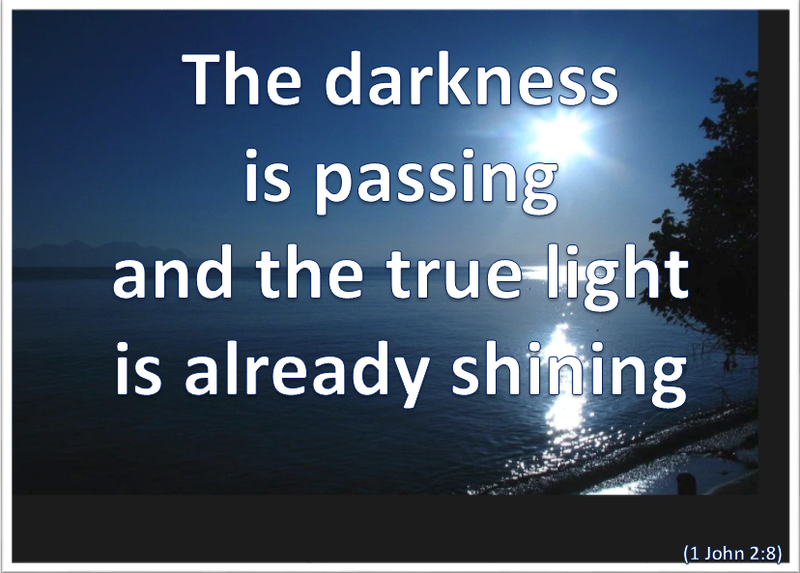 Whatever the state of your world hold onto the truth that the true light is already shining there. God is with us, and always will be. The Light of Christ is in my world – let me see and walk in His Light. Lord Jesus thank You that Your light is revealing the darkness in me and around me. Please help me to surrender my darkness to You and to avoid the darkness of the world – and please shine Your light through my thoughts, words and deeds. Amen.